That’s how Mexican immigrant Saul Chavez (photo, center), co-owner of El Gran Taco Loco with his spouse Angelica Quezada, describes his emotions following the destruction of his commercial space in the Mission and 29th streets fire last June 18. Chavez’ popular Mexican food eatery was located on the first floor of the Graywood Hotel, which suffered severe damage in the conflagration. Saul felt very sad over his loss. The space was a mess from water damage. His electrical items — large and small — were all destroyed. It was also a loss for the community. El Gran Taco Loco had served up to 350 customers a day, regulars enjoying a menu that ran the gamut from tacos and tortas to steak fries and carne asada. Saul’s depression increased when the owner of the commercial space decided to break the lease due to a clause that allowed either party to do so in situations where the property would not be functional for a specified period of time. That meant El Gran Taco Loco would lose its home of 12 years, with the landlord taking the opportunity to remodel and later ask for the much-higher rents the neighborhood’s Mission Street commercial corridor can now demand. While Saul will be offered first right to return, the higher monthly rent would make his current business model untenable. Once the initial depression over his loss had passed, it was time for Saul to take action. He was determined to somehow reopen his business and once again provide for his family. When he heard of a space available in the Excelsior — a space twice the size as his former location and for around the same rent — Saul seized the opportunity. He was cognizant that such commercial rentals go fast in San Francisco. “You have to jump on it quickly or it’s gone before you know it,” explains Saul of the urgency. That urgency translated to Saul applying for and receiving the $10K maximum available from the San Francisco Small-Business Recovery Fund. Last July, the City had granted MEDA the right to be the sole overseer of this fund. There was $50K total disbursed to five small businesses involved in the June 18 fire in Bernal Heights. Fondo Adelante was launched a year ago to provide access to capital for community-based businesses that may not be able to garner a loan at conventional financial institutions. Loans of $5K to $100K are available to small businesses throughout the nine-county Bay Area. Saul was offered a $70K Fondo Adelante loan — at lower interest rates than he could get from traditional financial institutions. 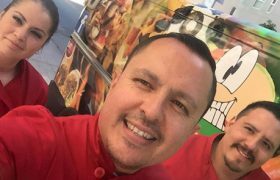 Now with the money to get his business going once again, Saul is scheduled to hire up to eight employees when he opens Nov. 1 in his Excelsior location at Mission Street and Brazil Avenue. This showcases how Fondo Adelante is building community capital.